The Sands is in 5 star resort in a great location right on Nangthong beach. It was completely renovated in 2012. Highly rated. The Leaf on the Sands is a cheaper alternative just behind the Sand’s with good rooms and two pools. It’s 400m walk from the beach and close to local restaurants, convenience stores and Khao Lak centre. 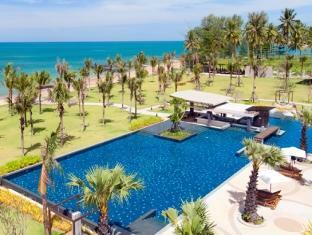 The Centara Khao Lak Seaview Resort is a 4 star well located on Nangthong beach. It’s a nice family resort. For budget accommodation in the Nangthong beach area try Monkey Dive Hostel. It’s new, clean and located in Khao Lak centre where the restaurants, bars and shops are. The beach is about 10 minutes walk away. Another good budget option is the Srichada Hotel which has cheap fan rooms set back from the main road in Khao Lak centre. In Bang Niang beach area the Parisia Guesthouse is cheap and close to Bang niang market. Baan Chongfa is a very good 3 star bungalow resort in Bang Niang. It’s close to everything yet feels like it’s hidden away. It’s only a small resort and can be hard to book, it’s often full. The Cousin resort is a lower budget bungalow resort on Bang Niang beach. Very cheap. Away from the centre of Khao Lak Baan Krating resort has lovely wooden stilted bungalows on the rocks and wonderful sea views. It’s a couple of minutes drive south from central Khao Lak and it won’t suit you if you don’t like climbing up and down steps but it’s a very pretty resort. A short drive north from Khao Lak centre is the Beyond Resort, a very stylish 4 star resort built in 2011. It will suit couples looking for a quiet escape in a luxurious setting with private bungalows. The Beyond is an adults only resort. Khao Lak is the ideal place to stay if you are diving the Similan Islands, Surin Islands, Koh Bon, Koh Tachai and Richelieu Rock. The Khao Lak area (it’s not really a town, more like a long strip of small beaches joined along the west coast of Thailand) is really built for tourists visiting these offshore islands. As the Similan and Surin national marine parks are only open from November to April each year Khao Lak is a very quiet place from May to October. Many local shops and restaurants close until the high season and there is no diving available. Hotels offer good promotions in the off season but if you are diver we don’t recommend Khao Lak at that time of year. Khao Lak is also close to Phang Nga bay (Khao Lak is in Phang Nga province) and Khao Sok, two places that should also be on your “to see” list. In three hours you can drive to Krabi, in ninety minutes you can drive to Phuket. So Khao Lak is a good base for all sorts of tours. Maybe because everyone is always out on tours you can sometimes walk through Khao Lak in the daytime and wonder where everyone is, it seems very quiet. The beaches have only a few sunbathers on them, wonderfully different from Phuket beaches. Our recommendation for divers staying in Khao Lak is to stay in the central beach areas. Khao Lak is actually very spread out along the coast and some resorts, like Le Meridien Khao Lak, for example are 10km or more from the main area. That’s fine if you never want to leave the resort but if you want to try some other local restaurants it’s better to stay in either the Bang Niang beach or the Nangthong beach areas. All dive boats will pick you up in these areas, if you stay further out they will charge you extra. Dive boats depart from Thap Lamu pier which is the Navy pier a few kilometres south of Khao Lak centre.